Where is the money going and why are some Bay Area projects stalled years after being funded? How would you spend $9 billion? That’s how much counties in the Bay Area have received from the federal government’s stimulus program in the three years since President Obama announced the American Recovery and Reinvestment Act . Overall, California has received $63 billion, with 14 percent of that directed to the Bay Area. The goal was to fund shovel-ready projects, give people jobs, and jumpstart the economy. 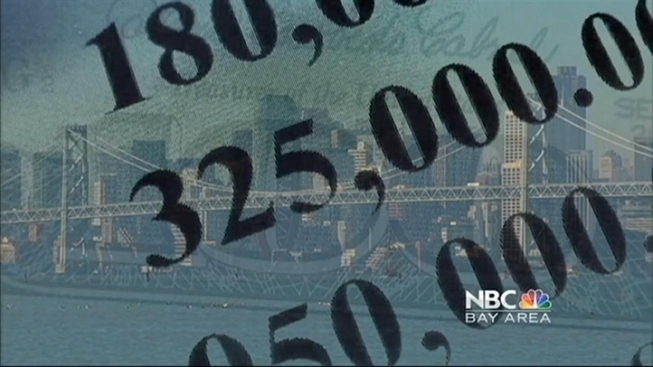 An NBC Bay Area investigation followed the money to see if those federal stimulus dollars are actually putting people back to work. Three years ago politicians in Washington and here in the Bay Area touted the urgent need for the federal stimulus package. Published economist and Santa Clara University professor Alexander Field believes the stimulus program has worked. The NBC Bay Area Investigative Unit spent weeks analyzing government stimulus data, in partnership with the nonprofit investigative news group ProPublica. Our investigation found that Alameda County received nearly $3.5 billion—more than any other county in the Bay Area. San Francisco and Santa Clara counties followed, each receiving more than $1.5 billion. All other Bay Area counties have received less than a billion federal stimulus dollars. San Mateo County received $866 million, Contra Costa County reeled in nearly $501 million, and Solano County received more than $292 million. Sonoma, Napa and Marin counties have received the least amount of stimulus support, bringing in less than $300 million in stimulus funding since 2009. But our computer analysis shows money approved doesn’t always mean money spent—or jobs created. According to the latest government data, 19 Bay Area stimulus projects funded in 2010 or earlier have not broken ground. That totals more than $70 million. They haven’t created jobs, either. We found two projects approved more than two years ago that have not even started. In 2009 the federal government awarded the Port of Richmond $4.3 million for a project to build a fiber optic network to connect the port security system with critical first responders like local police and fire departments. "Approved in 2009, and here we are in 2012 and how much of the project is finished?” NBC Bay Area chief investigator Tony Kovaleski asked Port of Richmond Development Project Coordinator, Michael Williams. “Well, none of the project is finished,” Williams replied. He said delays in other city projects connected to the port security job caused the slowdown in the stimulus project. Similarly, over at the Port of Oakland a $7 million high-tech security upgrade has been stalled since 2009. There, it has taken longer than two years to design a fingerprint security access system. Millions of dollars remain unspent, and not a single job has been created. Port Facilities Security Officer Mike O’Brien told us the port is waiting on the Transportation Security Administration to clear some hurdles before the project can go ahead. He said the federal government has yet to deliver rules on how to implement the port’s biometric security system. “Consequently, we’re being very careful about designing and constructing a system that meets those federal requirements that haven’t been put out yet,” O’Brien said. “What do you say to the people at home that are disappointed this project isn’t finished?” Kovaleski asked O’Brien. The Port of Oakland says it will apply for extensions with the government because it will not meet its original deadlines. Field calls the delays “regrettable.” He said for every stimulus dollar not spent, that’s two dollars not making its way through the Bay Area economy. That’s a reality felt at local businesses and in the unemployment line. Click here to view Bay Area stimulus projects that haven't started. Click here to view stimulus spending in California by County. If you have a story we should investigate, email us at: TheUnit@NBCBayArea.com.